A visit to Kerala would be incomplete without experiencing some of its finest cuisine, which is characterized by the generous use of spice and coconut. What better way to enjoy the cuisine than cooking and dining with a local family? We bring you this unique opportunity where a local family will host you and walk you through every step of the cooking process – from sourcing local produce to preparing a delicious Keralan meal. Mr. and Mrs. Nicholas will welcome you into their charming home on the backwaters and be your hosts for the day. Mr. Nicholas will accompany us to the market where we will buy fresh local produce, we will learn about different varieties of fish available in the market. Back at their home Mrs. Nicholas will prep the food and cook with us. She has cooked for her family all of her life and now wants to share her recipes with you! 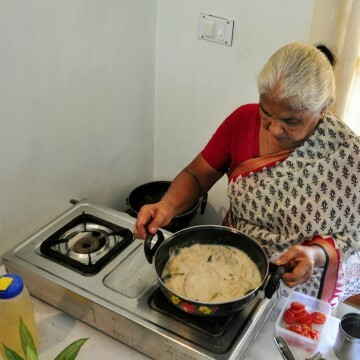 This Kerala Cooking Experience activity is designed to let you experience Keralan home cooked food in a family atmosphere and give you an opportunity to observe and learn while Mrs. Nicholas is cooking. Relish home cooked food with a local family! Visit the local meat market led by your guide. The fresh catch is generally sold out within three hours. After pick up from Kochi, you will meet your English speaking guide who will accompany you throughout this experience. We start the day by heading to the local market. We will be there early to ensure that we see fresh fish. In this market you will see a variety of sea food including king fish, anchovies, red snapper, oysters, marcel, prawns and shark. You can also buy mutton, chicken and beef. We will then drive a short distance to Thevara ferry point in southern Kochi. From here we take a ferry ride to the village of Nettor. After disembarking, we will take a short walk to our host’s home where you will meet Mr. and Mrs. Nicholas. After a short break to rest and refresh, we will head to the local market. The backyard of the Nicholas’ home opens to the backwaters and is shaded by big trees. You can sit and relax here or walk around the village until we are ready to cook. We leave the choice of participating in the cooking session entirely to you. If you want to learn how to cook, Mrs. Nicholas will teach you. A typical menu is outlined below, but can change based on seasonal availability. Pickup/Drop is include in the fee from Kochi town limits.